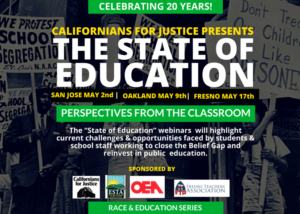 Californians for Justice and Teacher Associations in Oakland, East San Jose and Fresno team up to bring you the State of Education from perspectives in the classroom. 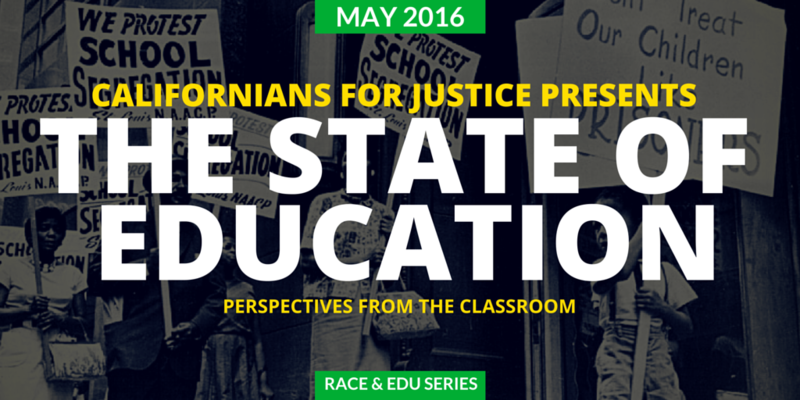 In celebration of Californians for Justice’s 20th Anniversary, we are kicking off a year-long Race in Education series across the State. The webinar will highlight perspectives from the classroom that are essential in this election year as we ask voters to reinvest in public education and close the Belief Gap. This is an opportunity for us to talk about what’s at stake for public education, and what are the opportunities for our communities to have Racial and Educational Justice and Equity in our schools. Why Social Emotional Learning (SEL) is just as important as academics for low-income and communities of color. The Belief Gap and why it is important to having equity in our schools. Re-authorizing Prop 30 and the future of funding for public education. ← Why California’s New Grading System For Public Education Should Matter To You!